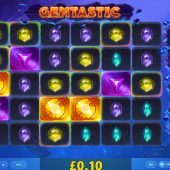 Gemtastic slot is part of Red Tiger's cascading series of games and joins some slots of varying quality ranging from the mundane mediocrity of Jack In a Pot to the far more exciting Tiki Fruits. Alas, from first impressions this looks even worse then the former of those two examples with pretty basic symbols and a plain blue background but at least the sound effects are far more futuristic than the appearance of the game is intended to be. Don't expect a game as interesting as Play'n Go's Gemix here, far from it, but actually it can offer up one or two surprises. 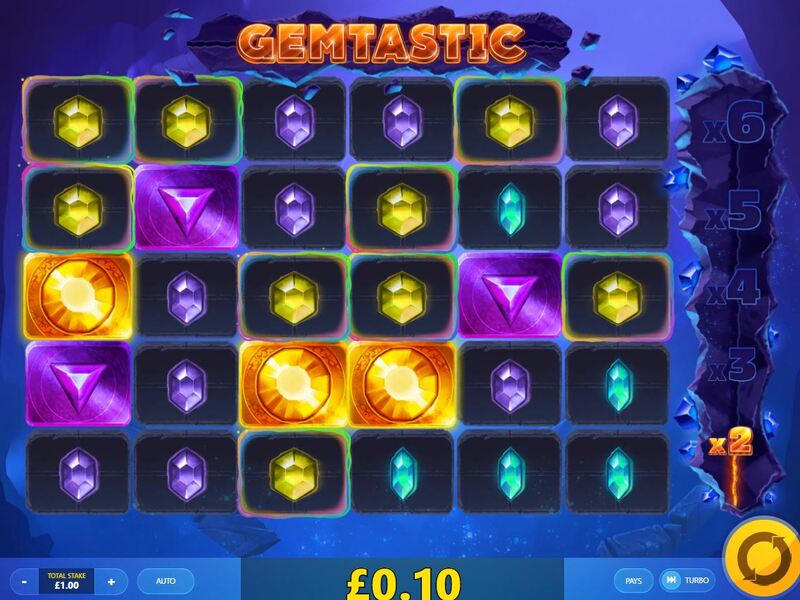 So will Gemtastic prove to be fantastic for our bankroll? Despite the appearance suggesting otherwise, this isn't a cluster pay game but simply has 30 paying lines over a large grid of 6 reels and 5 rows. All tiles are single but can fall in stacks of the same and you can randomly see 2x2 or 3x3 Mega Gems land anywhere on the screen. Any winning icons disappear and more cascade down from above to replace them. The highest wins therefore are 6-of-a-kinds which pay for the Wild 50x stake but these don't appear naturally on the grid as we'll discover. You have large gems with a background and Orange pays 8x, Green 5x, Red 4x and Purple 3x. The low icons are Yellow, Orange, Purple, Blue and Green small gems paying 48, 42, 36, 30 and 24 coins respectively for any line of 6. You don't see any scatters as there is no actual bonus round, but we do see a couple of notable spin enhancements. Any winning combination raises the multiplier on the right of the reels in stages of 2,3,4,5,6,8, 10 and 15x for successive wins on the same credit. On any spin all of one symbol on the grid may be surrounded by a glowing rainbow of colour. Any of these counting in a win will then disperse around the grid and turn to Wild tiles for the next cascade. You can see this repeat as long as fresh Wilds are used in subsequent cascade wins and sometimes the Mega Gems can also get the Magic Glow in which case they explode into separate tiles.